2013 is a slow year for Simply Rins. 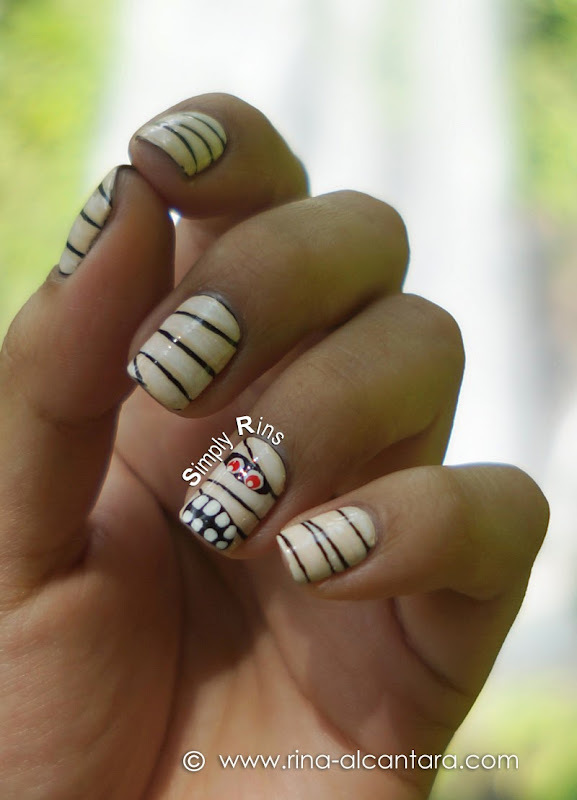 I usually allot the entire month of October to share Halloween inspired nail art designs. But this year came differently. But I can't let 2013 slip by without at least a Halloween nail art so ladies, here it is! 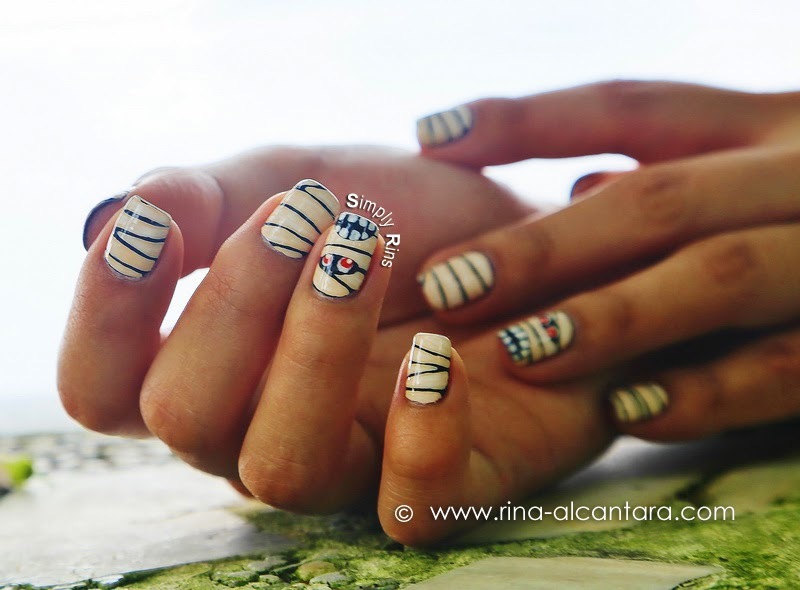 I have done a mummy nail art and decided to do a remake for a week long adventure I had with friends. Island hopping was in the itinerary and I initially wanted a beach inspired nails but since it is Halloween season, might as well wear Mummy nails! I did this freehand nail design the night before our flight and I wasn't able to take photos as how I normally do. The pictures here were all taken during our vacation. Base color is one coat of Dazzle Dry Midnight Express. I think a rich brown color for background would also work for this nail art. I used a detailing nail art brush and acrylic paints for the design. I mixed white and tan for the color of the bandages. To get that antique look, I watered down white paint and brushed a few strokes on the bandages. This extra detail actually makes a difference. I would have made a mummy on all my nails if I had more time. But wearing 2 mummies, 1 on each hand was enough to accompany me on my vacation. One good thing about this design is that chip offs from wear is welcoming and makes the mummy and the bandages look more authentic. I've been wearing this nail art for more than a week now and it still look good aside from the visible growth near the cuticle area. I didn't get to experience Trick or Trick this year but my mummies were able to go island hopping, enjoyed 2 waterfalls, and met new friends! How about you? How did you wear your nails for Halloween?